You are here: Home / Personal Finance / 15 ways How to teach your kid about money? Most of us feel that money is not the subject to be discussed with children. This is however a BIG mistake. They should be taught about finance from very early and here are ways to teach your kid about money. A lot of us refrain from discussing money with our children thinking it is too early and they will eventually figure it out themselves. This is a wrong assumption and may backfire, with your kids expecting you just as a free ATM for things they want and may throw tantrums when denied, due to you being genuinely not able to fulfill their wishes or because their demands are irrational. The other thing is they grow up not valuing money at all. This may result in them not being good with their finances. Very often until and unless your kids grow and earn themselves they don’t understand what is meant by Hard Earned Money. Do yourself and your child a favor and Teach your Child about Money, early in their lives. The other thing is today even when your kid goes to school, he/she may be surrounded by kids from higher income families then you, who flaunt that fancy compass and new stuff and this could make your kid demand the same from you time and again. This can further make them rebellious. 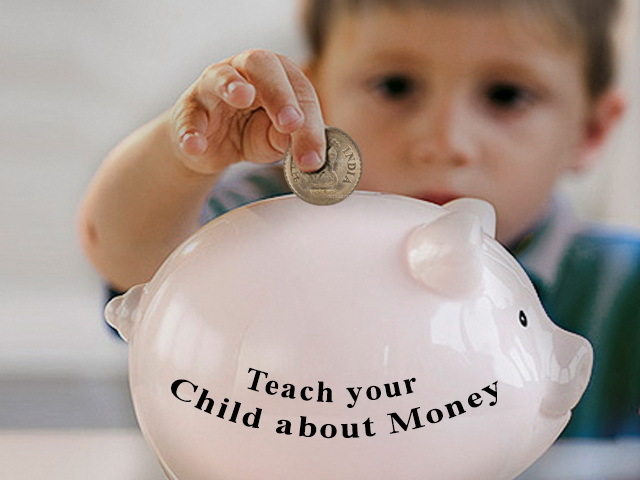 There are ways in which teaching your child about money can be fun and simple and at the same time teach them a good lesson about money and managing their finances nicely. Here are 15 ways to teach your kid about finance. 1. Teach the basics and Make it Fun: Start with the most basic aspects of money, why is it needed and the coins and notes and their values. Make the whole process fun by showing visual things with money. For instance if a Rs. 10 note can buy a pack of chocolate, show it and explain, the same is worth two coins of Rs. 5 each and so on. Make it interesting for the kid. 2. Give regular allowance and piggy banks: Once your child understands different money value, start with giving them regular small allowance that they must put in a piggy bank. You can give as little as 10 rupees a week from the age of about 3 years and increase it overtime if you feel so. This amount can be topped up for good behavior or bonus on birthdays or special occasions as incentive. 3. Goal setting and prioritizing: Just like you save money to make purchases, you need to tell the kids too, to set goals and why are they saving. For instance it is pretty common for your child to ask for a fancy compass box or some toy. Tell them what is more important to them, toy or the compass and that they can’t get both together. Let them know how long they need to save for it to be able to get it. For example if compass costs Rs. 100 and toy costs Rs. 500 and you are giving your 5 year old a weekly allowance of Rs. 15, they must now that with that money, they will need to save for about 2 months for compass and 8 month for the toy or assign them some goal or target by which you can reward them with additional cash and your kid can buy it early. The worth of the toy or compass or whatever they ask should be understood and known to them early on in life, so that they know how money is earned and value the things bought by you for them. Also instead of telling them outright NO, it is better to explain them how they can get it. 4. Teach and Reward for good savings: While it is fine to save for the toy or thing your kid wants, it should be taught to them, that all their savings should not be used to spend on things. They need to understand that once they spend all their savings on one thing, the next time they will need to save from zero to reach their goals. Instead tell them to save and set aside some part for the long term and use a portion of their kitty to buy new stuff. This is tricky and needs to be taught nicely and patiently. If the child understands this and actually saves more and decides to spend less, reward them for it. It may be that in case of the compass, he decides to save for 3 months and then buy the compass thus still having some money in the piggy bank. Reward your kid, not by extra money but going to a movie, picnic, an ice-cream, or an extra hour of cartoons or video games anything. This will motivate them to do it in the future too. Money is not as important for kids as it is for us grownups. 5. Differentiate between needs and wants: At the young age your kids may not be able to differentiate between needs and wants. Forget about kids, even we grownups rarely do that. It is important for you to teach them about this at an early age. Explain by example they can relate to. For instance shoes, your kid may have a pair for the school and maybe a pair for other occasions and he/she may ask for some new ones. By all means even we adults at times want things that we don’t need while these are kids. You can explain that school shoes are needs as otherwise they will not be allowed inside the classrooms, and they cannot keep wearing the same shoes when they go out with family so the other pair is also needed. The third pair of shoes they are asking are wants, and they can live without it. Explain this to them. They may feel disappointed, but then you can give them an incentive to save more or give them some target or tasks to accomplish so they can have it. It could be going to bed early for a month or completing homework quickly for a month etc. Avoid setting academic performance targets, like grades and ranks as this can be stressful to the kid. 6. Follow the EPF route: Just like your employer does with your EPF, you do the same with your kid’s savings. If he deposits Rs. 10 in the piggy bank, you deposit 10 from your end. Also tell your kid/kids about this practice. This will teach them a thing or two about real world finance. However this should be followed only after a certain age, maybe 8 or 10 years, when they can do the math and understand such concepts. Today’s kids learn fast. However make sure to put it in their heads that the extra money is not their savings, instead contributed by you, so they shouldn’t boast of it as their own savings. 7. Tell them how money is earned: After they are of about 8-9 years, explain them what you do to earn money. Don’t reveal them your income as they don’t need to know. However they do need to know that money isn’t free and all the allowances you are giving your kid are just part of growing up and learning process and that they themselves need to earn after a point in life. 8. Let them make mistakes: Every once in a while let them go broke and spend their savings on something like an expensive toy or unwanted stuff. Let them realize that this is not the way to manage money. They should know that at some point in their lives they need to take care of their money and you always will not tell them what to do. If they don’t have savings anymore, make them realize their mistake in a nice way and tell them how they can avoid it later on and become more responsible with money. Don’t give them money easily. Let them save again like they did before and if you feel the kid realizes the mistake then you can give some bonus or extra money, but not much. This small habit will go a long way in valuing money. 9. Look out for discounts and explain them to the child: After your child has the grasping of usual buying and selling and savings etc. it is a good idea to take them to shop and show them how bargaining is done as well as teach them about the various discounts and offers. Tell them why you made the purchases when there are discounts and how it helps in saving money and how it works. 10. Show them how you manage your expenses and savings, relatively: While you should not be telling your child exact salary or income, it is a good idea to casually tell him how you manage expenses and income and how household expenses are met, although by giving relative examples and percentages. For instance keeping your income as 100% you can then tell them that 15% goes to compulsory savings, 30% maybe EMI, 35% goes towards household expenses and utility bills etc, 20% maybe towards your child’s education needs etc. Whatever your outflows maybe, talk to them by telling you get 100% salary and from that how you manage the monthly expenses. 11. Teach them about Debt or Credit: Every once in a while let your kids purchase something small from their savings and you lend them a part of it. For instance, the same compass mentioned above, if that is worth Rs. 100, and your kid has saved Rs. 150, don’t let them use entire Rs. 100 from it. Instead let them use only Rs. 80 or so and you pay the Rs. 20. This is a good way of educating them about loans and debts. They may not grasp the interest rates and all that, but simple lending and borrowing is understood now. Your kid now owes you Rs. 20, even though you don’t want it as a parent, let them save that 20 and when they give it to you, you might as well compliment them for repaying their debt, and as a reward you can put that amount in their piggy bank itself. It is a simple lesson learned and plus your kid gets extra 20 bucks as savings even he/she’s going to be happy. 12. Play the Tax Officer: Once your child is about 10 years, tell them that whatever you earn you need to pay a part of it to the government for running the country in the form of taxes. So any income is taxable and while they need not learn the various tax brackets or heads under which tax is payable, but you can tell them that the amount in their piggy bank is a sort of income they get and hence a part of it every year after March, will be deducted. This can be anything 10-15%. You as a parent can take this money and deposit it in some savings account for your child, but make him understand that they will have to part with some of their ‘hard-earned’ money as tax. 13. Open a savings account for them: At some point you need to start a savings bank account for your child. Once the child is of an age that he/she can understand the stuff, you must tell them that what is the savings bank account about and what banks are for. This need not be too technical, just plain simple overview. They should be accompanying you to the bank once in a while and deposit some amount from the piggy bank to the savings account themselves. This will teach them a thing or two about banking. 14. Do it yourself: Whatever savings advice you teach your child, make sure you do it yourself. Kids observe their elders and if you fail to do the same, they will soon question your methods and teachings or may just not take them seriously. Also make sure you keep things simple and uncomplicated. They just need to know the basics well as the rest they will learn over time. 15. Don’t make them Money Minded: Teaching your kids about finances is important at the same time it shouldn’t be too preachy or complicated. The most important thing however is to make them understand that it is important to value money, but not everything should be seen in context of money. Your child should know that the allowance or weekly or monthly pocket money or savings money they get are from you, the parents. They should not feel that for everything they had to save and only then they got stuff. The idea is to teach your kids to handle finances early on, so they grow up to manage their own money better. However it should not be that money is the only thing that’s on their mind. Gift them stuff every now and then and not every purchase or things they need should come from their own money, just some things are fine to teach your child about finance. All this simplified approach should be to a certain age, and slowly-slowly the real world money concepts should be explained to them gradually over time. Once they are in college it is time to get down to real world money talks as this is the time they will face the real world. Until that time, the above simplified concepts of money should suffice.